There was a moment when my friend Megan and I looked at each other and sincerely wondered if we’d have to ask for another table. Maybe from now on, when I make reservations, I should put down how many entrees I’m planning to eat vs. how many people will be there. 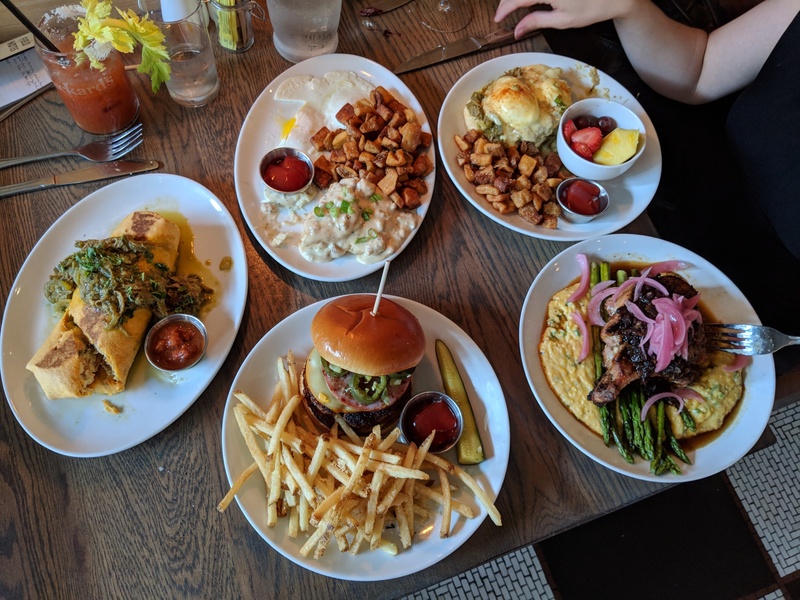 But leave it to the crack staff at Packard’s New American Kitchen to play a little dish Tetris and figure out exactly how to fit a tiny table for two with enough to feed an army. This is the eternal problem with brunch reviews. Eating enough food to adequately review the menu is easy when you can come back in for lunch or dinner a few times. 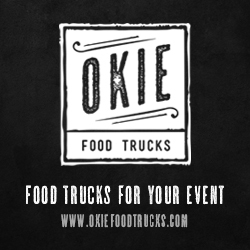 But brunch is often a once-a-week event and I’m lucky to get a free Sunday in a month to come try it out. This is why I’m so thankful for Megan, whose very physiology defies both science and religion. She’s my Ethan Hunt; no matter how impossible the meal, I know she’ll find a way to help me eat it. Her skills were sorely needed at Packard’s, where the amount of porcine goodness on the menu is probably the reason for Porky Pig’s stutter. That dude knows his days are numbered. Packard’s is a lovely restaurant with a largely open seating plan anchored by a beautiful bar. There are a few nooks and crannies, if you’re searching for privacy, but the giant windows and natural light makes the place feel airy and free. “This reminds me of a rich person’s kitchen,” Megan said. Pretty much exactly. It’s fashionable and functional. There’s a lot of natural wood and chalkboards showing the daily specials. They keep an entire fridge stocked with chilled glass water bottles for the tables. It’s nice enough that you can dress up and feel comfortable, but not so stuffy that you can’t dress comfortably and feel up for another flight of wine. Seasoned menu readers will be fine at Packard’s brunch, but anyone who comes in uninitiated is in for a deep philosophical and moral dilemma. Namely: should I get the breakfast board ($14) or the crab beignets ($12) or the smoked salmon ($12) or the raspberry chocolate chip muffins (2 for $5). I wish I could make this choice for you, but Packard’s already told me that, no, they will not call me everytime someone comes in for brunch and let me choose their appetizers. For the greatest variety, you’re hard pressed to find a better choice than the breakfast board, which comes piled with a picnic’s worth of tasty treats. 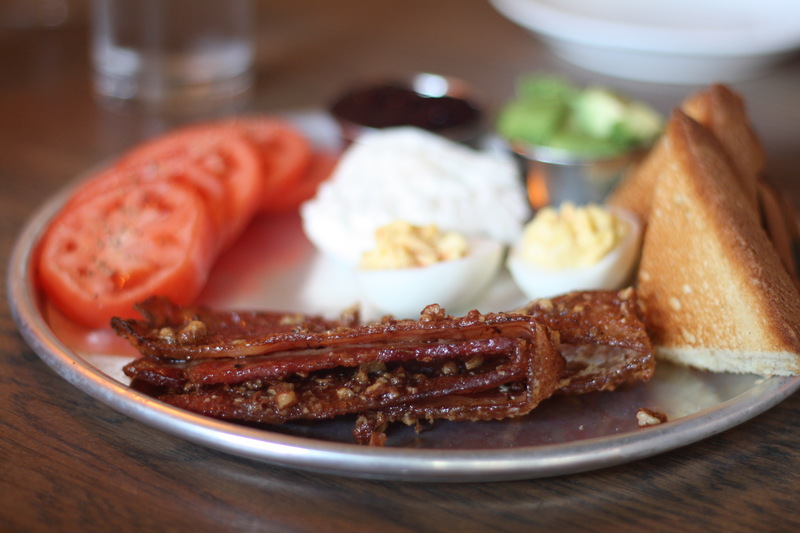 The praline bacon — sweet and smoky with bits of pecan glazed to the meat — is irresistible. “You know what this tastes like, and I mean it in the best way possible, but this tastes like barbecue potato chips,” she said. It’s true. There’s a hickory sweetness that permeates each bite and pairs extremely well with the creamy chill of burrata cheese, sliced tomatoes and ripe avocado. There’s also a pair of horseradish-y deviled eggs that I thought were heavenly. There’s also a berry compote jam and golden crisp toast wedges. Mix, match, munch, [insert fourth m word here] all day long. Or at least until the entrees arrive. I love breakfast burritos. I love lunch and dinner burritos, too. And afternoon snack burritos. I’m just a big burrito fan all the way around. And the bodega burrito ($11) is straight up tasty. 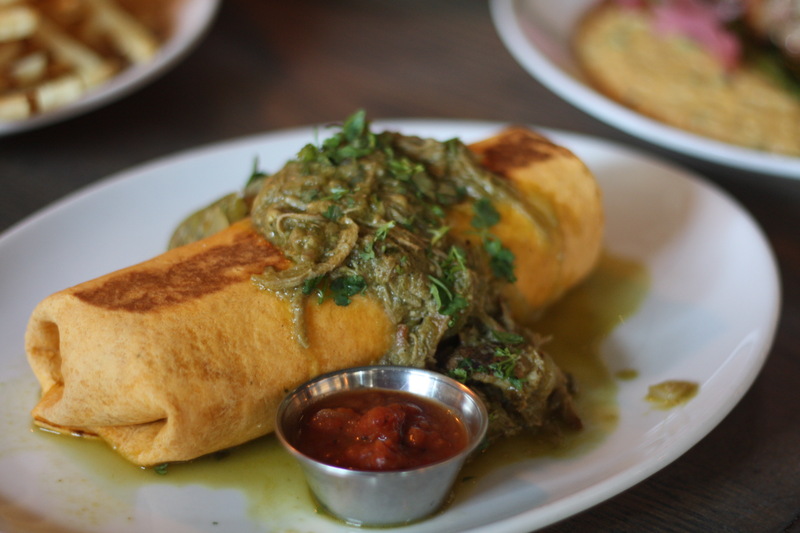 It’s a pretty standard burrito — a big flour tortilla stuffed with scrambled eggs, cheese, potatoes, peppers and onions — but the real show starts with a big pile of pulled pork verde on top. This is big and filling. Ask for a bottle of hot sauce to spice it up and you’ve got a breakfast of champions. 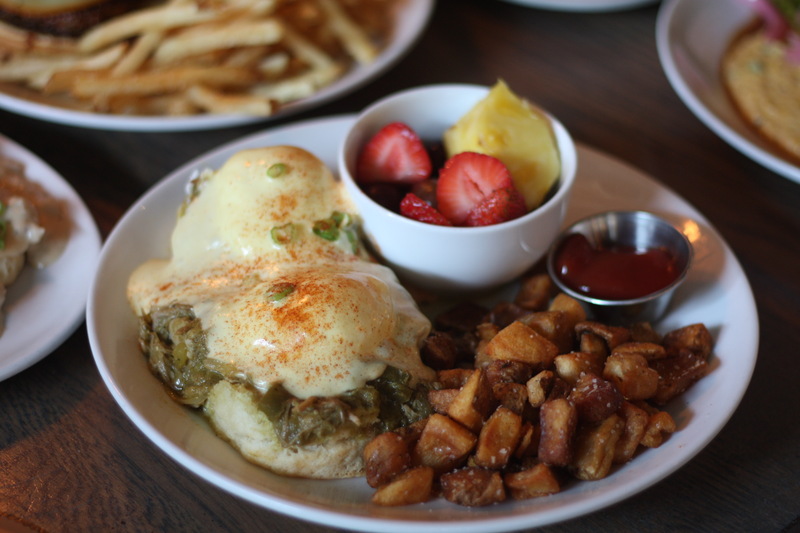 The pulled pork verde returns in a slightly more fashionable dish in Eggs Cochon ($14). It’s a benedict with the english muffin swapped out for a biscuit and the pork in place of canadian bacon. It’s a big delightful mess. Crack open those poached eggs and let the yolks mix with the hollandaise and the green chiles, then drag your home fries through the pool for added flavor. It’s hearty and tender, like a lumberjack who does cross stitch. You know I’m legally required to order the biscuit and sausage gravy ($11) no matter where I go, right? You can read the full write-up here, but needless to say, I am a fan. Packard’s is no stranger to great biscuit technology (a la spin-off restaurant HunnyBunny Biscuit Co.) and this plate, with eggs and home fries included, is proof. But if you want to get crazy, and I know you do, you sick freaks, then you have no choice but to order the Piggy Burger ($12). Much as I love a pork/beef combo burger, I was delighted to see that no cows were included in the making of this dish. The burger is ground pork, seasoned with blackened spices and grilled to perfection. 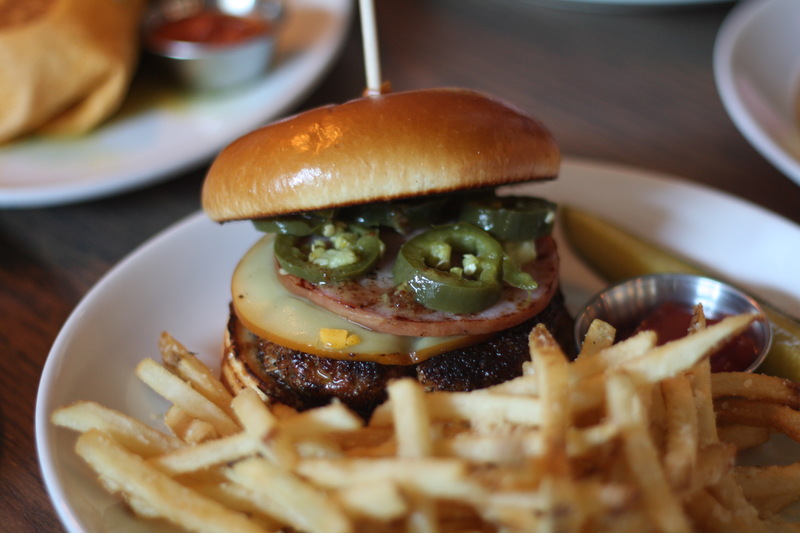 On top of that is ham, smoked gouda (I guess that comes from a cow…), pickled jalapenos and spicy honey mustard on a buttery brioche bun. Guys...this is a really good burger. And while it would be overkill to order it with bacon on top, I’m pretty sure next time I’m ordering it with bacon on top. This is cheating a bit, but I made sure in advance that I could order the pork chop ($25), which resides squarely on the dinner menu. But listen to this dish and tell me it’s not also perfect for brunch. You start with a massive bone-in, double-thick pork chop that is seasoned and cooked so perfectly that I’m almost positive witchcraft was involved. Do we have to storm the kitchen and put them through the Midtown Witch Trials? Probably. So go eat this before history judges us too harshly. 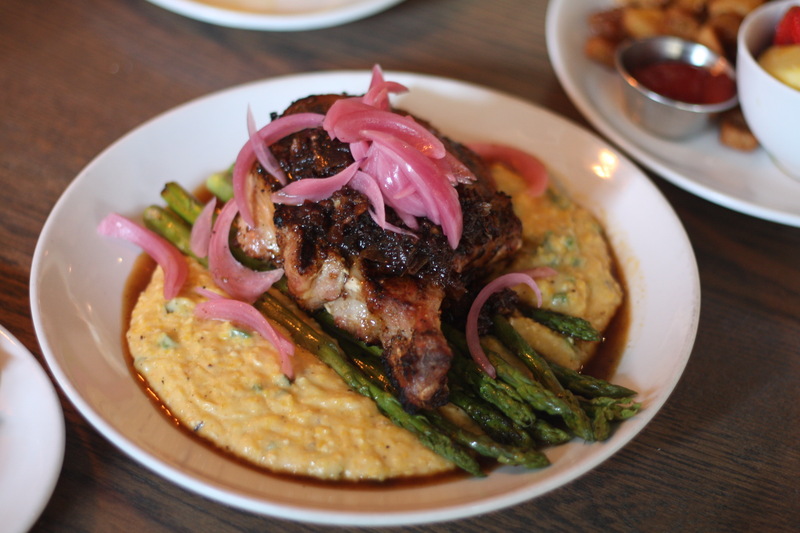 The pork chop is resting on a raft of asparagus in a sea of jalapeno-cheddar grits. Atop the chop is sweet and savory bacon jam and curls of pickled onion. Not only should this be on the brunch menu, it should also be on the lunch menu. And the dessert menu. Possibly listed with the wines and cocktails, too. It’s really, really, really, really good. Whatever pork chop related mishaps occurred in your past, this magical piece of swine will cure it and leave you at peace. “I’m glad a pig died for this,” Megan said.